Set SMART goals this year to stick to your New Years Resolutions. SMART goals can help you get through the Holiday season without added weight gain, and help you meet your goals year-round. 1. Be specific: “I want to be healthier” or “I want to tone up” is not specific. Think about why you want to be healthier or tone up, what does it mean to you to achieve those things? “I want to be healthier….to have more energy to keep up with the grand kids” or “I want to tone up….to fit into my clothes better or to look good in a bikini” is more specific. 2. Measurable: Another step further from step one would be to set a goal to lose about 15lbs and be 20% body fat, to be a specific pant size, lose or gain a certain number of inches, to be able to do real push ups or pull ups without assist, or run a half marathon in a certain amount of time. 3. Achievable and realistic: If you have had bad knees your whole life and have never been much of a runner, it may not be realistic to run a marathon. Or, if you want to weigh 130lbs but you have 130lbs of lean mass, that is not realistic either because you would have to lose a lot of lean mass in order to achieve the goal which I do not recommend. Write in your calendar certain benchmarks to keep you accountable, and make sign with your goals listed and keep them in places you will see them often such as bathroom mirror, fridge, car, computer desktop, phone background, etc. Make them look nice enough that you’ll want to look at them. Be careful not to get too focused on the numbers. For example, if your goal is based on losing weight, do not weigh yourself any more than once a week at the same time each week. It is sometimes helpful to have someone else keep track of the numbers for you, such as your personal trainer or a workout buddy, so you can focus on the process. In my experience as a trainer, if the numbers aren’t going in the direction that we want, I can help you adjust and fine-tune the process to make the numbers move in your favor again. 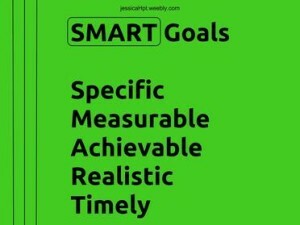 If you are not sure if your goals are realistic or achievable, or need help figuring out how to make your goals more specific and measurable, please contact me for a free consultation to set goals. Previous Post:Want to eat better? You need to plan your meals!